Data Elements? Business Elements? Maybe even Critical Data Elements? What are they and how do they help? While these are two distinct data elements they clearly represent the same concept with different identification, representation, and permissible values. It naturally leads one to the question – is there language to represent this concept? The good news is that ISO11179 does have a term to represent the concept. Harmonisation of key OTC derivatives data elements (other than UTI and UPI) – Initial release September 2015. Besides the fact that you can see the change from “Key” (Sept 2015) to “Critical” (June 2017), looking at the contained content you can see the CDE’s (June 2017) are defined with both a “Format” and “Allowable values” (i.e. “Y”/”N” etc). So these exactly match the ISO definition of “Data Elements” as they have both the “Representation” and “Permissible Values”. So it seems the both BIS, IOSCO and ISO 11179-1 all align to the same expectation of a “Data Element”, leaving us to wonder where our equivalent of “Data Element Concept” (or similar) fits into Data Management. 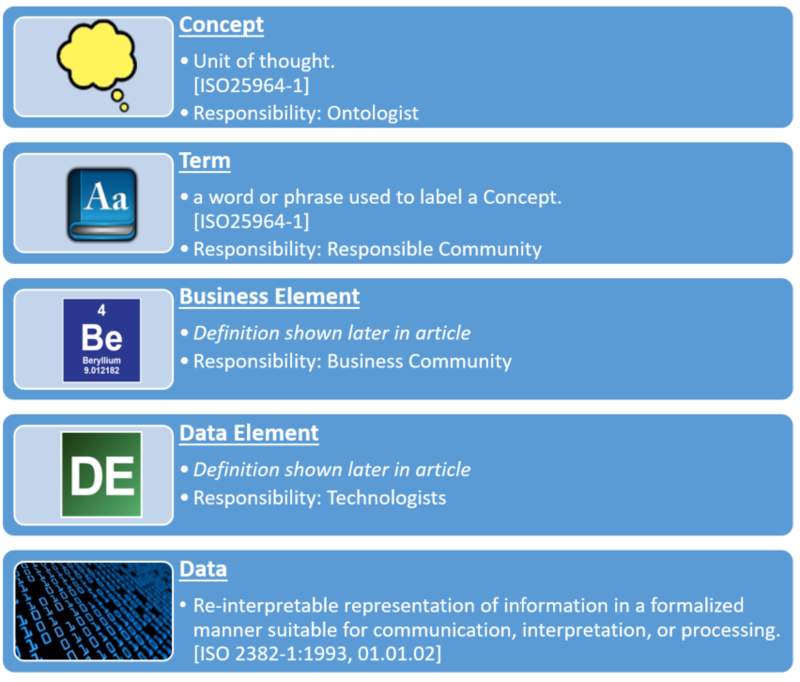 This is where the Data Management vocabulary separates a little from our starting point of the ISO Metadata standard (ISO11179). The terms are changed predominantly to help reinforce ownership and improve adoptability within the business community. It is understandable why some purists may be howling in pain now – but bear with us as we go down the journey. For full transparency, a Business Element is slightly different than a Data Element Concept and for that reason alone they should be called different things, however rather than performing a deep dive clarifying the exact differences between these two let’s step further back and consider the whole stack and see what else is in our vocabulary? 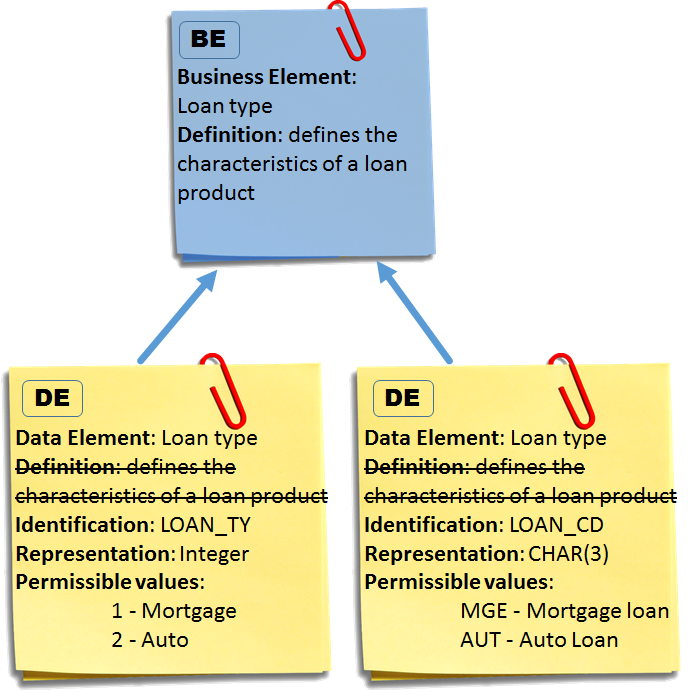 So we have now established an understanding of what a Business Element (BE) and Data Element (DE) is – what other concepts exist in this Data Management information landscape? Below is a classical view of the various element levels in a top down view of the landscape, and an approximate magnitude associated with each. The triangle is used to visually clarify that there are orders of magnitude between the counts of the layers. Strictly it wouldn’t be such a simple linear view and but presenting it this way is a helpful, especially as we then apply a responsibility to each layer. This illustration helps us understand the various levels of abstraction and understand which organization group is responsible for each layer. We still haven’t proposed a definition for a DE or BE, but before that let’s have a deeper look at what are the characteristics of each of these terms. 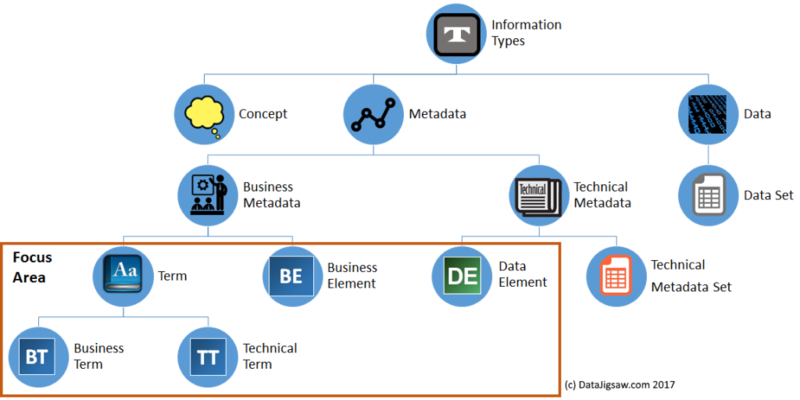 Below is a view of the high-level information artifacts in a simple classification to separate out concepts, metadata and data – and then show how Terms, Business Elements and Data Elements relate to those. A Term has meaning, but doesn’t have a context outside of a specific vocabulary it resides in. Maps to one or more Business Terms, and if the BE meaning is simple it can be inferred – else requires to be directly stated. Up to now we have described what a DE and a BE is, how they fit into the landscape and why they exist – but we haven’t actually assigned robust definitions. Note this may realise a Business Element in a physical form. 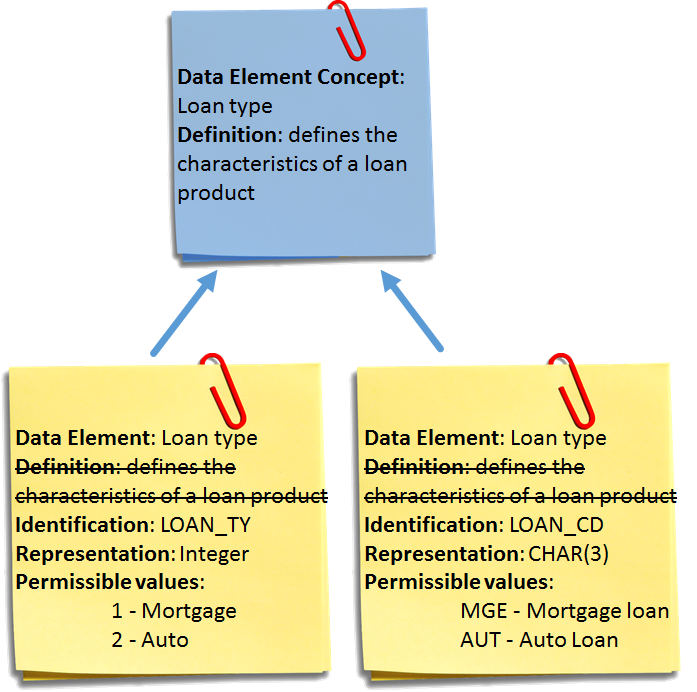 The description for a term is constructed by referencing its parent as part of the description, this allows us to see that both the Business Element and the Data Element are both types of Metadata. For transparency, this wasn’t done for Term because in this specific case it was felt there is little confusion as to what type of information it is, and staying aligned with the various ISO standards was more appropriate. Another benefit from these definitions is that we can clearly articulate that a Data Element isn’t an actual data value. As we start to discuss the process of measuring data quality (DQ) and Data Set’s the understanding of a “Data Element” can easily get blurred between Data and Metadata. It’s a slippery slope, but with these definitions the meaning is always clear. So to answer the tagline of “To DE or to BE that is the question” – to successfully manage data within an organization you can’t operate only be in the weeds at the DE level, but have to recognize all the layers and how they interact. Business Elements are a core requirement that is a key part of Data Management.